Potency testing is defined in 21 CFR Part 600.3(s) as “the specific ability or capacity of the product, as indicated by appropriate laboratory tests or by adequately controlled clinical data obtained through the administration of the product in the manner intended, to effect a given result” (1). Potency measurement is especially important for complex products such as cellular therapies (CTs). It is considered an essential aspect of the quality-control system for a CT drug substance and drug product. It is performed to assure identity, purity, potency (also called strength in FDA documents), and stability of products used during all phases of clinical study as well as for licensed products (2,3). As such, potency assays are used, along with other analyses, to demonstrate that only product lots that meet and continue to meet defined specifications or acceptance criteria are administered during all phases of clinical investigation and following market approval (2). In addition, potency is measured to meet the requirements of product conformance testing under 21 CFR 601.20(a) (4), as a crucial component of comparability studies (5), and to gain evidence that adjuvants and other substances added to a drug product do not adversely affect its potency (21 CFR 610.15(a)). Human cells are regulated as biologics if any of the following criteria are met: They are more than minimally manipulated, they are combined with an article other than a preservation or storage agent, they are used in a way that is not homologous to their normal function, or they have a systemic effect and depend on the metabolic activity of living cells for their primary function. As biological products, cellular therapies are regulated under section 351 of the Public Health Services Act (42 U.S.C. 262) and the Food, Drug and Cosmetics Act (21 U.S.C. 321 et seq.) They also must comply with FDA’s current good manufacturing Practice (CGMP) regulations for Finished Pharmaceuticals (21 CFR Parts 210 and 211) and with relevant sections of the biologics regulations at 21 CFR 600. Compliance with these requirements applies to all biological products, including autologous and single patient allogeneic products, in which a lot may be defined as a single dose (2). In addition, cell therapy products must comply with applicable parts of the current good tissue practice (CGTP) rules in 21 CFR part 1271. The FDA pairs cellular therapy products with gene therapy products for regulatory purposes and refers to them as CGT (cellular and gene therapy) products. Regulatory submissions for CT products are reviewed by FDA’s Office of Cellular, Tissue and Gene Therapies (OCTGT) in the Center for Biologics Evaluation and Research (CBER). The FDA feels that “These regulations provide considerable freedom when evaluating suitable potency assays” (6). For approval of a biologics license application (BLA), CT products must meet the requirements of safety, purity, and potency prescribed in the above regulations. However, as stated in FDA’s guidance on CGT potency testing, “FDA regulations allow for considerable flexibility in determining the appropriate measurement(s) of potency for each product.” As is typical, the FDA evaluates the adequacy of potency tests for such cutting-edge products case by case. (2). 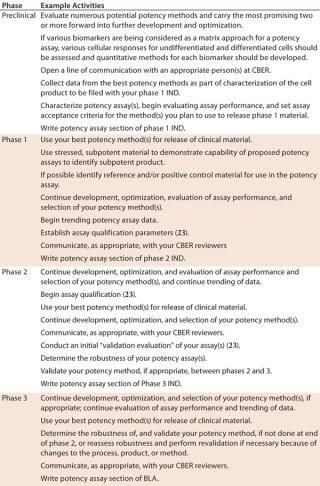 In reviewing a potency assay to be used for release testing of a licensed product, the agency considers whether the method meets the following regulatory requirements and expectations (2,6). The method should represent the product’s mechanism(s) of action (MOA), relevant therapeutic activity, or intended biological effect and/or other relevant product attributes, unless diligent and well-designed studies demonstrate that this is not possible (e.g., because the MOA is extremely complex/not known/cannot be adequately characterized). The method ‘s (or matrix of methods’) ability to measure activity/strength/potency (FDA often uses these terms interchangeably) of all active ingredients should be demonstrated. The method should provide quantitative test results for product release. If development of a quantitative biological assay is not possible, then a quantitative physical assay that correlates with and is used in conjunction with a qualitative biological assay can be used (7). 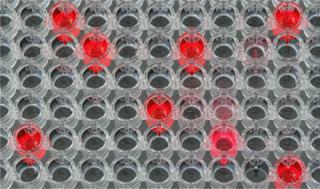 Method results, or the results of at least one method in the assay matrix, should be available in time for lot release. The method should be demonstrated to contribute to the prediction of clinical efficacy for each lot of product . The FDA recognizes that no single test adequately measures all product attributes predictive of clinical efficacy; manufacturers typically demonstrate clinical effectiveness by a summation of evidence and data that include potency measurement with other analyses and data from clinical trials, especially pivotal trials. The method should meet predefined data acceptance/rejection criteria (often called system suitability tests or assay acceptance criteria). Appropriate reference materials, standards, and/or controls should be included in the method. Accuracy, sensitivity, specificity, and precision of the method should have been established through method validation. The method ‘s capability to be stability indicating and provide data to establish dating periods should be demonstrated. The method should be shown to demonstrate lot-to-lot consistency. “An ideal potency assay,” according to Denise K. Gavin (CBER), “ is a bioassay that meets all the criteria. But it may not be possible or feasible to perform a bioassay that includes all these criteria for every product. When a single bioassay does not meet all the criteria listed here, it may be necessary to develop one or more additional assays” (6). This is often true for CT potency assays. For most biotherapeutics, a potency assay is formatted as a relative potency assay using a biological read-out system. Typical read-outs include up-regulation of a single active protein, increased or decreased cell proliferation, up-regulation of apoptosis markers, or another specific immune response. The hallmark of these assays includes generation of t wo complete dose response curves, one for the product reference and a second for the lot being tested for release. (Figure 1a). In a well-behaved relative potency assay, a quantitative estimate of potency can be performed by looking at the shift of the test lot dose response curve along the x axis. (Right-shifted product is less potent — it takes more to elicit the same response; left-shifted is more potent). Measurement of that shift typically requires an increased or decreased dose response across several logs of drug product concentration. For investigational CT products, the FDA recognizes that in early phase clinical investigations, it may not be possible for a sponsor’s potency and other methods to meet all requirements described above for licensed biological products (2), especially requirements for a quantitative bioassay. However, the agency does expect sponsors of cellular therapy clinical trials to submit adequate data to provide clinical-phase–appropriate assurance of the clinical material ‘s identity, quality, purity, and strength/potency (21 CFR 312.23(a)(7)(i). providing data to support correlation studies, if those are necessary. Sponsors often seek to delay development of a potency assay until after phase 1 (P1) because of the significant resources required to develop a biological method. This approach is not recommended. Early in development it is critical that the sponsor clearly demonstrate that its proposed assay can fail subpotent material. Too many sponsors spend scientific resources developing biological potency assays to demonstrate how “good ” (potent) their lots are. Instead, early development teams should obtain purposely degraded product, often chemically and physically stressed material, and demonstrate that this material either has low measured potency or has such an altered dose response curve that it is nonquantifiable in the potency assay. This ability to differentiate low or nonfunctioning lots is critical to support clinical studies. The biotherapeutic industry has many case studies of products that “ fail ” in the clinic simply because severely subpotent product was unknowingly administered during early phase 1–2 clinical studies. The FDA guidance document recommends that sponsors practice “progressive potency assay implementation” (more on this below) and have timely discussions with their CMC review team and/or other appropriate agency personnel. Such discussions are especially important because a considerable amount of data is usually needed to implement a suitable measurement of potency and decide which assay(s) to use. Also, specific details of those methods typically change as clinical development proceeds (2). Another frequent question has to do with when a sponsor should validate its potency assay. This is a complex decision and dependent on many factors. But assuming your product poses no special concerns such as safety issues, reviewers typically ask for potency method validation before phase 3 trials or at the time of BLA filing. If safety concerns exist, such as in the expression of a highly potent protein with a known narrow therapeutic window, reviewers may request a validated potency method before you initiate phase 1 clinical studies. In the absence of FDA or other concerns, sponsors typically qualify assays for release of phase 1 and 2 material and validate critical methods, such as the potency assay, before releasing material for the pivotal trial (often phase 3) material (8,9). Experience shows that not having assays for critical quality attributes can halt or even kill a product’s development. Many sponsors have found themselves on clinical hold if they did not have a validated potency method (or at least one that was clearly nearing a “validatable” state) to present at the end of phase 2/prephase 3 meeting with the FDA. Even worse, sponsors may be unable to prove that proposed commercial material reflects the potency of pivotal clinical material. The first case slows product development, whereas the second can result in completely losing the product unless expensive clinical trials are redone. The FDA appears to have more flexibility in validating potency assays for cellular products. “ While a validated potency assay is not required until licensure,” said Gavin, “there are a number of advantages to beginning potency assay measurements during early product development” (6). At the very least, by the end of phase 2, a sponsor should have considerable data demonstrating that its potency assay(s) measures an appropriate biological activity (7). Such data should focus on the assay’s capability to distinguish potent product from adulterated, subpotent, and hyperpotent product. The data should demonstrate that the product matrix without the active ingredient (or with an irrelevant cell type) or progenitor cells do not elicit a positive response. A clear rationale must link the mechanism of action (MOA) of the product to the basis of the potency assay. The method should be qualified and have a known precision and relative accuracy. Most important, the potency assay should be sufficiently developed such that it can be used to release pivotal trial material with methods sufficient to link it to future proposed commercial material. Acquire as broad and in-depth as possible an understanding of the biological and other properties and actions of the cellular therapy product(s) for which you wish to develop potency methods. You should collect sufficient product characterization data (molecular, biochemical, immunologic, phenotypic, physical, and biological properties) throughout preclinical and clinical development to inform and refine your approach to measuring potency. Acquire broad and in-depth knowledge of the process by which your cellular product is manufactured. Familiarize yourself with the way in which the product is administered and the events that follow administration. Start designing and developing two (or possibly more) potency assays early — as early as during preclinical development is desirable. Developing at least two different methods increases your chances that one of them will be suitable for both your company and the regulators. design and development for GMP use requires considerable, specialized, and varied knowledge and experience. If you are not already an expert, either become one (for suggestions, see box, Gaining Expertise in Biological Potency Method Development”), find and apprentice yourself to one in your organization, hire one, or engage the services of an expert consultant. Be sure to confirm that any prospective employee or consultant has specific knowledge and experience in developing and validating biological potency assays. Initiate and maintain a discussion with your CBER Reviewers so that you have agency feedback to assist in your development decision making. Familiarize yourself with all relevant regulations and guidance and get current and stay current with the technical literature. Thoroughly characterize all rare and other reagents, reference materials, standards, and controls. Thoroughly characterize and qualify your potency assay(s). Give regular technical presentations to gain input from your colleagues. Be diligent in creating a formal Method Development Plan and in keeping a Development Report and refer to them often. If you outsource development of your potency assay(s), always have a knowledgeable and experienced employee or consultant, whose services your company has engaged, guide and manage the product development. The complexity of cellular therapies necessitates complex methods to measure their potency. Such assays are often difficult to design, develop, establish, and implement (3). The potential difficulties are manifold and can consume significant time and resources before they are overcome. One of the greatest challenges is the complex MOA(s) of these products, which may not be fully characterized or understood. For example, the cells can have multiple effector functions, and multiple steps may be required for those functions. The in vivo fate of a cellular product also can be quite complex and make design and correlation of a potency assay with the physiological mechanism of action of the cellular product difficult or impossible. The cells may need to differentiate, once administered, into a desired cell type, and they may migrate from the site of administration. Throughout method development, no matter how complex the MOA is for a CT product, it is critical to keep in mind that selected potency markers should be present in potent cells but missing in subpotent or undifferentiated cells. Limited lot size is an often encountered challenge. A lot may be a single dose or multiple doses to treat only one patient, and consequently contain limited material for testing. A single-dose therapy, for example, could use autologous cells suspended in a small volume. Another significant obstacle to overcome is the inherent variability of cellular therapy starting materials. Nevertheless, steps should be taken to obtain sufficient cells for testing. If a reference cell line can be created and a relative potency format used, this will help overcome limitations of the variability of the biological read-out system. Autologous and allogeneic donors are highly variable, cell lines are heterogeneous, and each patient can represent a new lot, making CT lot-to-lot variability quite high. The multiple cell types in autologous and allogeneic cell preparation can complicate characterization (and even identification) of active ingredient(s). In addition, stability depends on cell viability and thus is limited. For example, a cell-based vaccine may need to be injected in a patient within an hour or at most a few hours, leaving little time for measuring potency. As mentioned earlier, a matrix of potency assays probably will be necessary, at least at the early stages of CT development, compounding the challenges by increasing the number of methods needing design, development, and optimization. To add to the difficulties, many method types have technical limitations to be overcome or circumvented. They include high variability in assay results and an on–off dose–response curve that resembles a binary function rather than a more gently sloping dose-response curve to use for quantification. This may require sponsors to switch from more typical relative potency assays to those that monitor the switching on of appropriate protein expressions and/or cellular functions. The “potency” assay may therefore become a matrix expression of appropriate cellular responses. This would entail yes–no binary methodology with an assessment of determining positive and negative responses. Appropriate reference materials can be difficult to generate and qualify. If a cell-line is established that mimics the test material, it can be used as a stable “product-like” reference material. However, its dose–response curve is often dissimilar in shape to that of the test material. In such a case, the product reference becomes a positive control to demonstrate that the potency assay is functioning as expected and that hypo- or hyperpotent responses are due to the test lot rather than the biological read out system. Finally, many cellular products cannot be cryopreserved and must be administered as soon as possible after harvest. Their testing, shipping, and administration procedures must be rapid to ensure product quality, potency, and integrity. Although many unavoidable difficulties are encountered along the tortuous path to a biological potency assay for a CT product, you can also prevent many self-inflicted problems. Table 1 summarizes method development challenges, along with some possible solutions. Because measuring potency for cell therapies is challenging, the FDA has been flexible about allowable methods (10). Numerous and varied types of assays are potentially useful for measuring potency of cellular products: bioassays involving in vivo animal methods; in vitro cell, tissue, or organ culture systems; and in vivo and in vitro methods in combination. For cases in which such things as properties of the cell product and/or technical limitations of bioassays make development of a suitable bioassay not feasible, “assays based on immunochemical, molecular, or biochemical characteristics of the product can also be used to demonstrate potency, provided that they directly reflect, or are correlated, to a biological activity” (6). For example, it may be possible to use a biological marker or a nonbiological surrogate measurement of biological activity if correlation can be shown to a relevant product-specific biological activity or activities (2). s that affect cell function, so they may be unsuitable for potency measurement. Instead, it is important to identify functional biomarkers that correlate with, e.g., cell survival and in vitro differentiation. Those can detect unacceptable behavior of cultured cells and detect functional cells in a complex mixture (11). Such markers can be identified through genomic and/or proteomic techniques. In some cases, one assay is insufficient to measure potency, requiring use of multiple assays to demonstrate potency for regulatory purposes. Such an “assay matrix,” as the FDA refers to it, might combine biological assays, biological and analytical assays, or analytical assays alone (2,12,13). Table 2 provides examples of methods that have been used or auditioned for potency measurement of CT products. As discussed above, because of the significant challenges to establishing potency assays for cellular products, the FDA permits — in fact, even suggests — an incremental approach to development and implementation of potency tests (calling it progressive potency assay implementation). According to this approach, development and use of a potency assay — or, more likely two or more assays — begins as part of product/active ingredient characterization during preclinical development. Development and optimization proceeds incrementally during clinical development. Final validation is performed and final specifications determined for filing with the BLA. 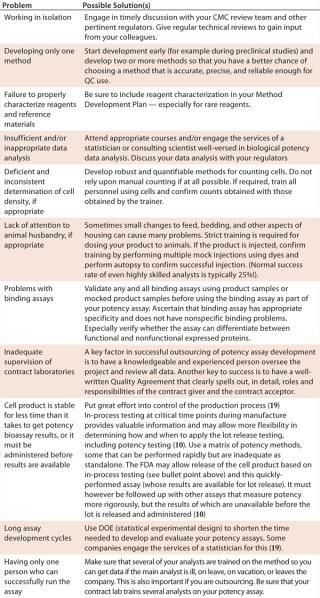 Table 3 provides examples of “progressive potency assay implementation” activities that might be performed at each stage of product development. Keep in mind that, because your potency measurement(s) will evolve and may change significantly as you develop your product, the agency recommends that you have timely discussions with your CBER review team as you design, evaluate, and validate your potency. Note and Proviso: The following discussions are adapted from the indicated references, and the information is current as of the committee meeting from which these references derive. But they may not completely reflect product potency testing and specifications for CT products as they exist today. Thus, the case studies should be seen and used only as examples of the kinds of potency assessments that companies have presented to FDA advisory committees. Apligraf Case Study (15, 16): Organogenesis Inc. makes its Apligraf bilayered tissue construct with an upper layer that is made of human keratinocytes and a supporting lower layer that is constructed of bovine-derived collagen and human neonatal foresk in-derived dermal fibroblasts. The layers adhere as one unit to form the Apligraf product. It is manufactured using allogeneic keratinocytes and fibroblasts derived from neonatal foresk in of human donors. Apligraf uses include treatment of surgically created gingival and alveolar mucosal surface defects in adults and the treatment of venous leg and diabetic foot ulcers that have not healed with conventional therapies. At the time of the committee meeting from which our information derives, Organogenesis was seeking a BLA to license Apligraf treatment of surgically created gingival and alveolar mucosal surface defects in adults. It had been previously approved by the FDA as a device (under PM A P950032 on 22 May 1998 and 20 June 2000) for treatment of venous leg ulcers (VLUs) and diabetic foot ulcers (DFUs). It is currently considered a combination product, and the BLA is still pending. Product potency is a key characteristic and is determined for this product at the mature product stage of manufacturing using a histological analysis of biopsies obtained from the final bi-layered product (reference 22, page 16, provides a flow diagram of Apligraf manufacture). A set of histological parameters collectively assess the quality of the epidermal and dermal layers present in the final product. Parameters assessed are epidermal coverage, epidermal development, basal aspect, suprabasal aspect, dermal thickness, fibroblast density, and matrix aspect. The assay is supported by in vitro and in vivo studies that correlate various histological potency parameters with the quality of the two layers and their resulting functions. The histological potency measurement uses hematoxylin and eosin (H&E) staining to distinguish fibroblasts and collagen within the dermal matrix (lower layer) as well as keratinocytes within the epidermal layer (upper layer). Those stains distinguish the basophilic and eosinophilic cellular structures within the tissue layers. Relevance of the morphological structures to the function of the Apligraf product, as observed through the histological parameters of the potency assay, is proposed to be as follows: First, the lower dermal layer is believed to provide both a structural matrix for the fibroblasts and a substrate for the development and maintenance of the upper layer. Second, the upper epidermal layer is believed to impart important structural elements to the construct, which contributes in turn to its biomechanical strength, handling properties, and barrier properties. they are sliced into 3-mm strips and further processed, embedded, sectioned, and stained according to established standard operating procedures. Slides are assessed using light microscopy, as described in the “Apligraf Histology” box. Reference 22 provides a detailed description of additional characterization methods and studies supporting the potency assay as well as functional testing methods used to support the histological potency assay. Supporting test methods include percutaneous water absorption, a mitochondrial tetrazolium testing (MTT) assay (viability), and assay for VEGF (vascular endothelial growth factor) concentration, and an in vivo nu/nu mouse assay. The rationale for establishing specifications for the histology assay (see the “Proposed Specifications” box) is that the proof of concept and performance for the original Apligraf product were first demonstrated in early nu/nu mouse studies (circa 1980). Because of the limited product shelf-life, the applicant conducted bridging studies in the early 1990s to develop an in vitro assay for lot release. Those studies were used to correlate Apligraf performance in the mouse model to the histological parameters of the final construct before grafting. The applicant implemented the histological assay for premarket approval (PMA) in 1998 and has not changed these specifications in the current BLA application. The following are the histological parameters of Apligraf ‘s potency assay. So Apligraf product potency is determined by a set of histological parameters that collectively assess the quality of the epidermal and dermal layers present in the product after maturation. These parameters include epidermal coverage, epidermal development, basal cell layer, suprabasal cell layer, dermal matrix thickness, fibroblast density, and matrix aspect. They were shown to correlate with percutaneous water absorption, cell metabolic activity by MTT, VEGF secretion, and an in vivo mouse assay. Provenge Case Study (9,17): Dendreon Corporation makes Provenge (sipuleucel-T), an autologous cellular immunotherapy. It contains a minimum of 50 million autologous CD54+ cells activated with PAP-GM-CSF and suspended in lactated Ringer’s injection in a sealed, patient-specific infusion bag. PAP-GM-CSF consists of human prostatic acid phosphatase (PAP), an antigen expressed in prostate cancer tissue, linked to human granulocyte-macrophage colony stimulating factor (GM-CSF), an immune cell activator. The active components in this product are autologous antigen–presenting cells and a recombinant protein (PAP-GM-CSF). It is indicated for treatment of asymptomatic or minimally symptomatic metastatic castrate-resistant (hormone refractory) prostate cancer. At the time of the committee meeting from which the following information derives, Dendreon had completed several phase 3 Provenge trials. Dendreon submitted a BLA for the product on 30 October 2009, and it was approved on 29 April 2010. Because this is a live-cell product and its shelf life is only hours, the Provenge quality control (including potency measurement) is severely constrained and quite challenging. In addition, the starting material is very heterogeneous. Material available for testing is limited. To make things even more problematic, the product has HLA-restricted antigen-presenting activity, but the HLA haplotype is unknown because the company does not “ haplotype the patients as they walk in the door” (9). To develop potency measurements, the development team focused its efforts on antigen-presenting cells (monocytes). 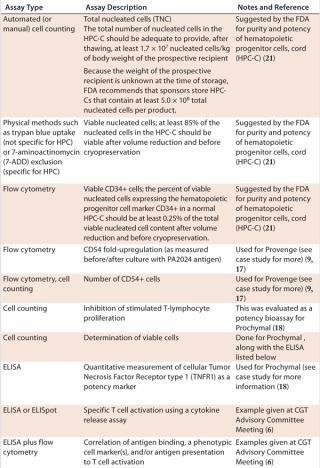 From early clinical lots, a minimum required number of CD54+ cells — as measured by flow cytometry and cell counts — was established. In addition, CD54 upregulation is measured by flow cytometry before and after culture with the antigen. The flow cytometry method uses commercially-available fluorescently labeled antibodies. Calibration bead standards (also commercially available) are used to standardize the flow cytometer and for assay acceptance criteria. With SOPs and trained personnel, the flow cytometry method is reproducible, robust, and linear over the range of values and validatable, making it suitable for a GMP environment. For more details, see references 9 (particularly the transcript) and 17. Prochymal Case Study (18): The Prochymal therapy consists of adult mesenchymal stem cells, derived from bone marrow aspirated from healthy donor volunteers, for treatment of graft versus host disease. The product is manufactured by Osiris Therapeutics Inc. At the time of the committee meeting, Osiris had two ongoing phase 2 clinical trials and based on the preliminary data, had started to design a phase 3 trial. The product is currently being evaluated in phase 3 trials for several indications, including acute graft-versus-host disease (GvHD) and Crohn’s disease. It is the only stem-cell therapeutic currently designated by the FDA as both an orphan drug and fast track product (www.osiris.com/therapeutics.php). If we are successful with this article, you will gain a sense of how difficult designing and developing potency measurements for CTs can be. We hope that out references, resources, and suggestions will help you ascend the steep learning curve of this demanding activity. Our examples and case studies should provide you with some productive points of departure. We welcome your comments and questions. Laureen Little, PhD (biotech@ix.netcom) and Tom Pritchett, PhD (biotech1ster@gmail.com) provide consulting, training, and informational publications, including their weekly newsletter BioQuality (www.bioquality.biz), for the biopharmaceutical and biologics industries. Laureen is the founder of the nonprofit BioPharmaceutical Emerging Best Practices Association (BEBPA) (www.bebpa.org). 1.). Title 21 of the United States Code of Federal Regulations. 3.) Stroncek, DF. 2007. Potency Analysis of Cellular Therapies: The Emerging Role of Molecular Assays. J. Transl. Med. 5:45. 6.) Gavin, DK (CBER Office of Cellular, Tissue and Gene Therapies, Division of Cellular and Gene Therapies). 2006.. Presentation at the Cellular, Tissue, and Gene Therapies Advisory Committee Meeting. 8.) Ritter, N. 2004.. What Is Test Method Qualification?:32-47. 9.) Provost, N. 2006.Potency Testing for an Autologou Cellular Immunotherapy, Presentation at the 9 February meeting of the Cellular, Tissue, and Gene Therapies Advisory Committee. 10.). Based on FDA remarks, titled. 11.) Benton, K 2007.. (CBER Division of Cellular and Gene Therapies, Office of Cellular, Tissue, and Gene Therapies). 12.) Advisory Committee (CTGTAC) Meeting 2006.. 17.) Finn, T. 2010. Summary Basis for Regulatory Action, PROVENGE (sipuleucel-T).